There are so many different places to find recipes - magazines, books, blogs, friends and family. And as a result, we each seem to acquire quite a collection of handwritten cards, ripped out pages, and printed pieces of paper just waiting to be tried or used again. If you're anything like me, most things in that collection don't seem to ever make it past that waiting stage because I either forget about them or can't find the recipe when the time comes. It is so nice to have everything stored together in one place on matching cards for the holiday. And it becomes very easy to sort through the cards making a list of ingredients that need to be purchased before all the baking begins. This seemed like the perfect thing to then share with you so that you too could get things prepared for the upcoming season filled with dinners, parties, baking, and more. Please know these printables are for personal use only and should not be resold or altered in any form. These cards could also be printed and cut out to wrap up and give as a thoughtful gift to friends and family who enjoy spending time in the kitchen. 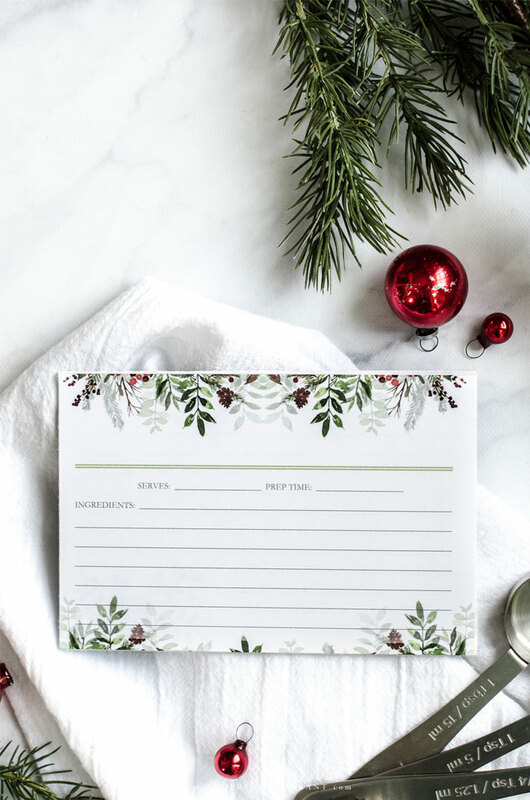 It seems as though there are always people who pop up on your shopping list that you want to remember with a gift without having to spend a great deal of money. A small stack of these cards tied together with a new dish towel is all you need to let someone know you appreciate them around the holiday. The cards have been designed to be double sided. You can either use your printer's two sided printing option if it is available, or do it it manually by printing one side of the card and sticking the paper back in face-up before printing side two. 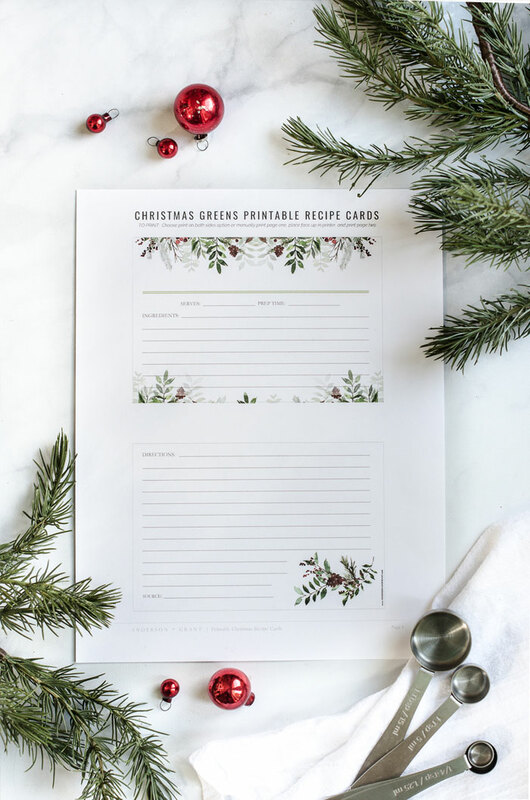 To make durable, long lasting recipe cards, you'll want to be sure to use a heavier white card stock over average printing paper. 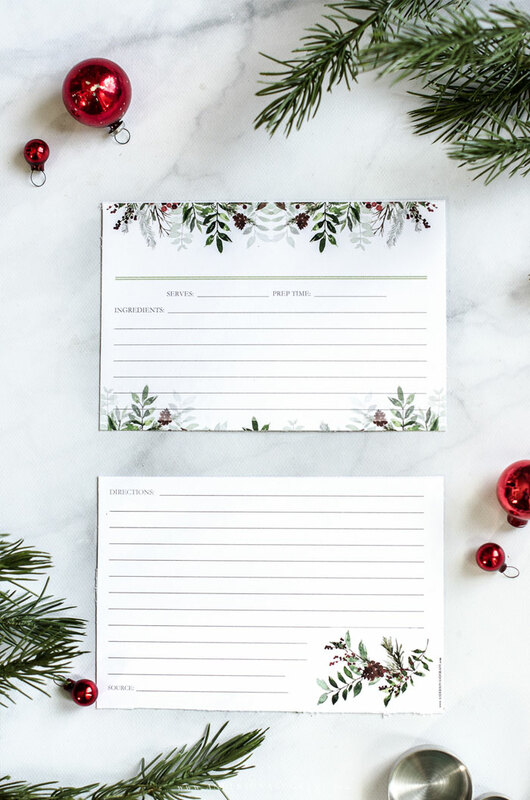 Once your cards are printed out, just cut along the lines printed on the page. Because it is hard to sometimes get things to line up perfectly coming out of the printer every time, I have designed these cards to only have a cutting line around the fronts of the recipe cards. That way, if the paper didn't come out exactly in line on the second side, you'll never be able to tell once they are trimmed. 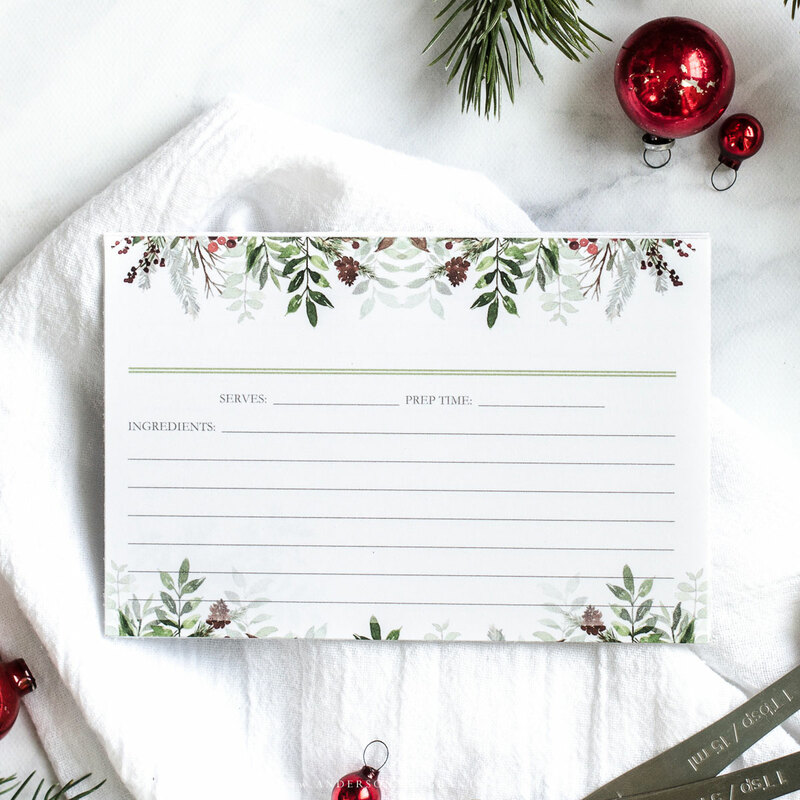 I hope you enjoy creating some of these cards and organizing your holiday recipes as much as I have! 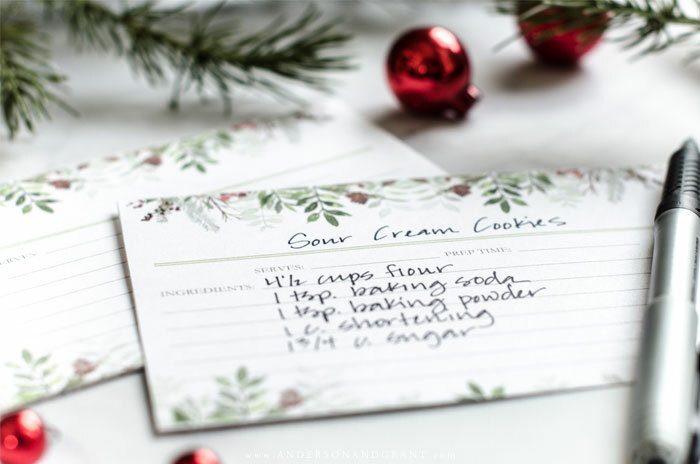 It seems so festive to be making your favorite Christmas cookies while using a card designed for the season. 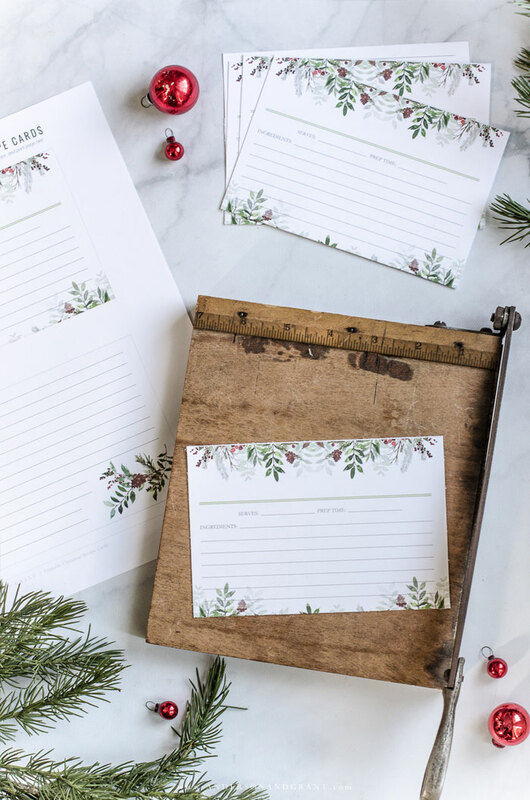 Be sure to visit some of my friends below to see the lovely Christmas printables they've created to share with you.